Formlabs Clear Resin is great for producing parts requiring translucency—and, with the right post-processing techniques, transparency. Use the following finishing methods to create transparent 3D printed parts for a variety of applications, from optics to light pipes to fluidics. Methods range from quick solutions for adequate transparency, to niche techniques for creating optically clear parts. Formlabs Clear Resin is ideal for showing internal details, housing LEDs, or creating windows. Formlabs and our customers have used Clear Resin to create a completely optically clear lens for a fully 3D printed camera, tiles for a Fresnel lens installation in Times Square, light pipes, millifluidic devices, and more. 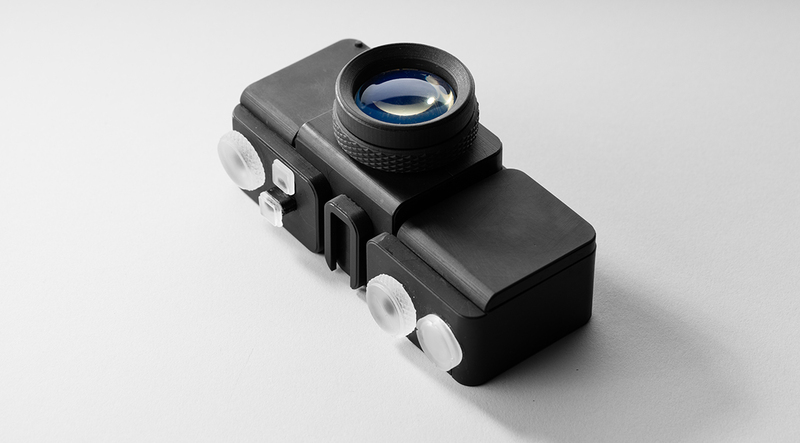 Formlabs applications engineer Amos Dudley designed and 3D printed a lens for a fully 3D printed camera. We’ve tested several techniques for post-processing parts printed in Clear Resin. In this post, we’ll cover manual sanding, clear coating, and resin dipping. Each finishing option requires varying levels of effort, depending on the degree of transparency and surface finish your part requires. Applications: Manual sanding and polishing can be effective for simple shapes with few details, but are less suited to finishing complex models. It is very difficult to reach total optical transparency with this method. You’ll have to sand to extremely fine grits to manually finish a transparent part, but with some effort, you can sand and polish parts to be as clear as a magnifying glass. It is, however, very challenging to completely eliminate all layer lines via manual finishing—you may notice micro-scratches when holding the part at a shallow angle to the light. Instructions: Use a range of incremental sandpaper grits to smooth your surface, then polish the part with acrylic cleaner and a microfiber cloth. At around 3000 grit, stereolithography (SLA) printed parts become glossy and very smooth to the touch. By 12000 grit, they are reflective. Try using a range of sandpaper and micromesh pads with grits from 400 to 12000, in increments of 200, slowly and carefully to clean the lens between grit levels and to eliminate scratches from the previous level before moving on to the next. Our support site offers a simple visual step-by-step guide for manual sanding, including an optional finish with acrylic spray. If you only need semi-transparency, simply use mineral oil to create an even finish and hide any light spots on your part. We’ve tested a variety of methods of polishing clear 3D prints, from hand sanding and spray coating to resin dipping. Applications: Spray coating is an easy, fast way to improve the clarity of parts without much reduction in detail. This method is effective for all kinds of models, as it's able to coat complex details that may be hard to reach with regular sanding and polishing. Clear coating alone helps to conceal layer lines and protect parts from UV exposure, which can cause yellowing and unintended post-curing. If you’re looking for a smooth, glass-like surface finish, perform the manual sanding and polishing technique prior to coating; the more sanding that comes before clear coating, the better the clarity. This additional step is great for post-processing prototypes that look like fully transparent plastic, e.g., packaging, bottles, and microfluidics. Instructions: There are several options for clear coating, from inexpensive sprays to products that require a dedicated room and tools. General purpose clear coat spray paints: Options range from decent, very inexpensive options like Rustoleum Painter’s Touch 2X to affordable higher quality sprays like Spray Max 2k Clear Glamor. Automotive sprays: Products like Lesonal Universal Clear, a high-solids acrylic urethane clearcoat, offer very high gloss and are designed for air-dry and baking conditions, but require a spray gun and dedicated space for spraying. Lesonal Universal Clear and similar sprays require a base coat. 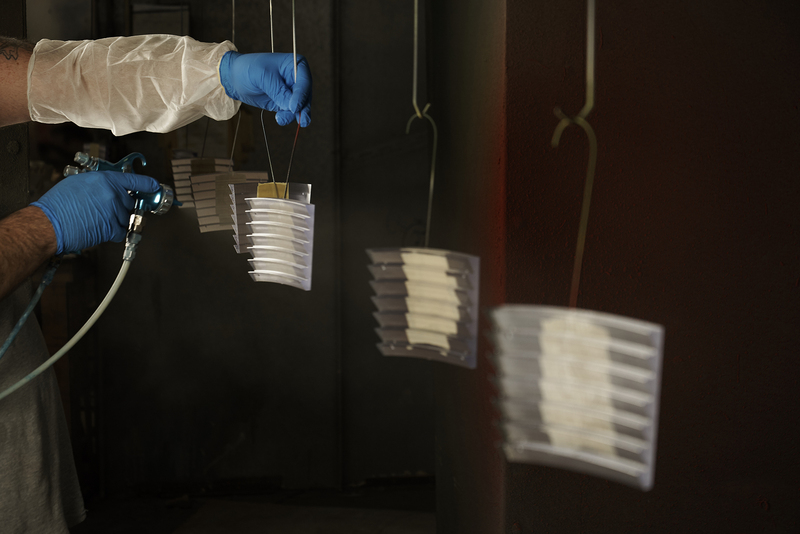 For spray coating, start with a clean, dry part already washed in isopropyl alcohol (IPA). Do not post-cure the part ahead of spraying, as this can cause yellowing. Let the part air dry. Once it’s completely dry, apply two to three spray coats in a dust-free environment. For a fee, auto body shops may do the coating for you with a spray like Lesonal Universal Clear. In most cases, these shops will use a light solvent, like naptha to clean and prepare the part’s surface prior to painting. For an installation in Times Square, Window to the Heart, the Formlabs and Aranda/Lasch teams worked with an auto body shop to spray coat each tile in Lesonal Universal Clear. Applications: This method is best for when you need very transparent parts, and only works on flat or near-flat surfaces, such as a lens or a window into the interior of a part. Resin dipping results in parts that are extremely smooth, with clear and sharp surface reflections. This technique can be used to create an even smoother finish for parts printed in other SLA materials, although it can reduce detail. Instructions: Apply Clear Resin to the part with drops from a syringe, or by dipping the part as as desired. The viscous resin will fill layers and scratches on the part, forming a completely smooth surface. The layer of resin should be as thin as possible, while still eliminating layer lines. Pull off any bubbles with a syringe. Completely post-cure the part using the appropriate settings, then repeat the process for the other side, both dipping and post-curing. 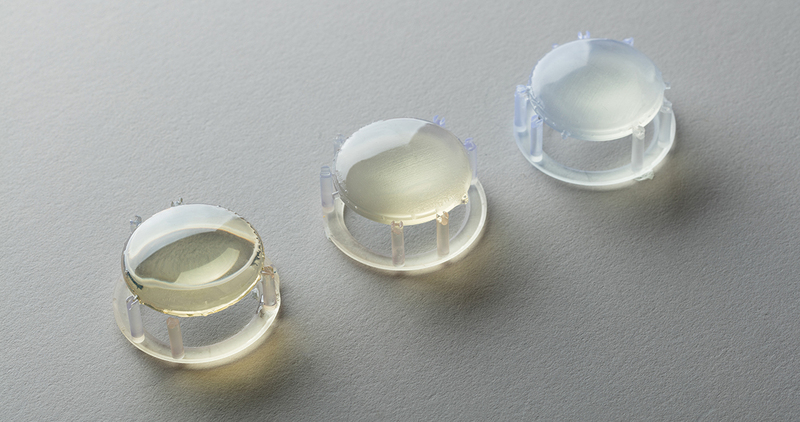 Three stages of resin-dipped lenses, with the final lens on the left. Note: The dipping process alters focal length slightly for lenses. For our 3D printed camera lens, Formlabs applications engineer Amos Dudley designed and printed a lens testing device. Explore our library of resources for more design and post-processing tips, along with other tutorials, white papers, webinars, and more. Request a free sample part printed in Clear Resin to see Formlabs quality firsthand.